Buyer Agents wanted on a fixed price basis. Real Estate Rift or Rebate Envy? Olympics fever has everyone writing about, Granted, Boston.com, the tag for Boston.com’s real estate blog has been "Everything you need to know about Boston’s other spectator sport" since it launched. 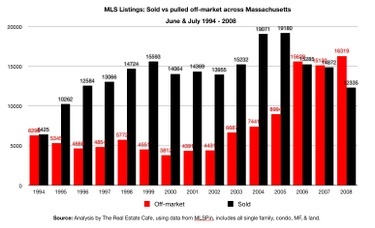 Yesterday’s blog entry was entitled "Real estate games." Perfect timing for FSBO open house this weekend at TogetherInMotion.com in Arlington, MA. A leading group of real estate technology innovators is using a sports metaphor, the "Real Estate Olympics", to launch a compelling, timely competitive for the "Real Estate Pacesetter of 2008." However, the first nomination (Zillow.com) and next week’s run off between eight companies to pick a single winner suggests that this competition will be a battle of the GIANTS. Compare that with Seth Godin’s presentation on "Small is the New Big" to the same group of innovators at ConnectNYC07 and Time Magazine’s Person of the Year in 2006: "YOU". If you translate those MEGA-trends into an Olympic metaphor, you get a different kind of competition and a different call for "Best of Breed." Just as the Olympics have 302 events, there are hundreds of steps in the home buying and selling process and real estate innovators empowering consumers with money-saving, do-it-yourself tools at EACH STEP in the process. 2. Explaining how you help do-it-yourself home buyers or sellers save money (or time). Any nominations we receive before this weekend from innovators, or consumers who rave about them, will be showcased at our first "FSBO Trade Mart," tentatively scheduled this weekend at TogetherInMotion.com, One Broadway, Arlington, MA. Watch Twitter & FriendFeed for more details. The Real Estate Cafe is advertising buyers on Zillow to make it easier for motivated sellers, particularly those who have received pre-foreclosure notices, to find them. If none of our buyers wants to purchase your home, we offer seller services "a la carte" on a fee-for-service basis. If you’d like to learn more about how to sell your home "for sale by owner," we’re organizing a FSBO support group and invite you to see our "FSBOs on Steroids" presentation. If you’re not interested in selling on your own, we’d also be glad to do a Listing Agent Report Card to help you select a new listing agent and try to negotiate a reduced commission. Email for more details. MLSPin: single family, multi-family, condominiums and land. Temporarily withdrawn listings available for 2008 only.